With the addition of Trinidad and Tobago's Women's 4 x 400m Relay added to the 2nd OECS Championships line up as they seek to qualify for Rio, BVI Athletics Association officials are now expecting 185 visiting athletes and officials for the 2 day competition on Saturday and Sunday. With the July 11 window for qualifying for the Olympic Games in Rio closing, the competition has become a last chance qualifier for Rio, with a mouth watering display of talent at the A. O. Shirley Grounds. In all, all 9 OECS Countries-Anguilla, St. Kitts-Nevis, Montserrat, Antigua & Barbuda, Dominica, St. Lucia, St. Vincent & the Grenadines, Grenada and hosts BVI-will be joined by non OECS Members, Puerto Rico, U.S. Virgin Islands, Barbados and Trinidad & Tobago, making it the meet the biggest to ever be staged in the BVI. 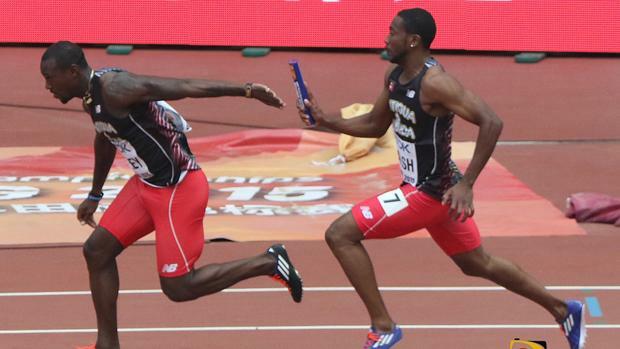 On a program already filled with hot action, Saturday's 4x100m Relays are sure to be barn burners when Rio qualifiers Antigua and Barbuda, St. Kitts-Nevis and Barbados men line up on Big Blue, with all three teams having run under 38.68 seconds. St. Kitts-Nevis which is among the eight teams automatically qualified for Rio by virtue of a finals berth in the IAAF World Relays last year, will bring their 38.76 average from two races into the completion. Antigua and Barbuda already assured a spot in Rio with their 38.07 average is ranked as the #10 team heading into Rio. Barbados at #17 with their 38.60 average will need a time of 38.59 seconds to bump Cuba from the #16 sport and book their ticket to Rio. Saturday's Women's 4 x 100m Relay will be no less appealing with Puerto Rico, St. Kitts-Nevis and the BVI as the headliners. Puerto Rico with their 43.53 seconds average is the #16 team in the rankings and will be seeking to hold on to that sport for Rio. The BVI who will bring a 44.05 seconds time into the field will be joined by OECS record holders St. Kitts-Nevis. With Trinidad and Tobago needing a time of 3 minutes 28.63 seconds to qualify, the Women's 4 x 400m on Sunday evening will definitely see the 20-year old All Comers Record record of 3:45.12 established by a St. Kitts-Nevis quartet going out the window. The Trini's will be looking to move from #20 to #16 for a spot in Rio and comes into the competition with their 3:32.25 average from a year ago. They will certainly get competition from Grenada, St. Vincent and the Grenadines and hosts BVI and if Puerto Rico enters, it makes it another track burner. Opening ceremonies are set for 3 p.m. on Saturday with action kicking off a 4 p.m. and at 4 p.m. on Sunday. Admission is $10 for adults, $5 for children and the limited VIP red seats for $15.